Here is my design process for a new non-profit USA Christian based Ministry named Families Outreach. Families Outreach is a non-profit Christian ministry that will deals with adoption and orphan care. Our primary aims will be to provide financial grants to couples who are adopting, give financial and material support to orphan care providers (i.e. orphanages, similar NGO’s), and to raise awareness of the worldwide orphan crisis to engage more involvement. ↑ Mind-mapping and initial sketches. ↑ Further sketching and experimentation. ↑ More keyword research and refinements. ↑ Getting every idea out of my head onto paper helps me narrow down choices. This contemporary and rather simple design is based upon an egg-shaped contained within a letter “O”. The whole concept behind the “egg idea” is to show a symbol of life, family and nurturing contained within the “O”, which represents the word “Outreach”. The hidden meaning behind the egg-icon isn’t something that is instantly attained by the viewer, but the subliminal nature of the icon should convey and positive and intriguing message about the Families Outreach organization. The concept (and thinking) behind this design is the use of two “pebbles” to represent an adult and child in a very metaphoric loving/caring pose. The style of the design inviting, with a contemporary illustrative-tone of the pebbles drawing the viewers’ attention. This stylized, script-styled logo design has a personal feel that is friendly, soft and inviting. The whole emphasis of the concept is based on a metaphor of giving and family. The flower, then, ‘metaphorically’ represents either a family or family-life in general. These two logo concepts focus more of the financial aspect of your organization. Both use serif-styled fonts with an icon that alludes to finance. 4a: The “F” symbol represent Finance with an “O” (Outreach), which also represents a coin. 4b: This design is more symbolic, which offers a recognizable mark to show sharing and growth. The emblem also “points” to the Families Outreach text. ↑ The client loved this font, but I suggested a “nest idea” to accompany the text as an alternative. ↑ After further reviewing, it was decided that I make changes to the first design. I changed the flower and made the font more legible. Note that I have changes to some letters, more so to the letter ‘m’. For the past few projects I have worked on, I have only initially designed the logos without colour to start off with. This is so the formation of the designs can be judged without colour bias. This is a tip I learned from designer David Airey. ↑ Tri-colour, duo-colour and single colour options 1. ↑ Tri-colour, duo-colour and single colour options 2. ↑ Tri-colour, duo-colour and single colour options 3. ↑ Tri-colour, duo-colour and single colour options 4. ↑ Colour modifications from option 4. ↑ More tinkering and final Pantone® colours chosen. ↑ Colours when reversed on white. 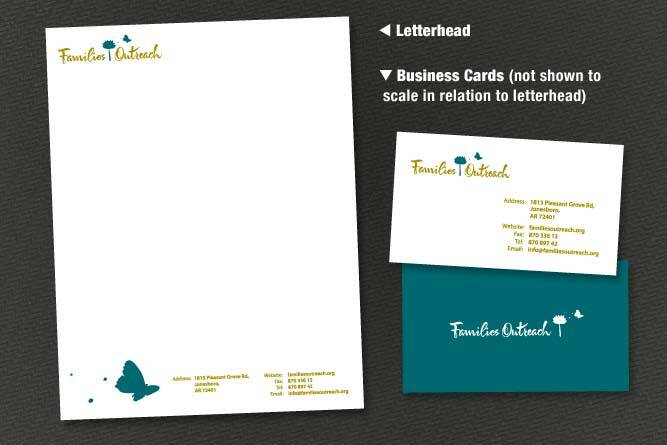 ↑ Letterhead and business card designs. You may have noticed that I haven’t displaced every single PDF proof page like in my post Total Design Process for Church Edit. However, if you want to know anything about the decisions I made in the design process, please leave a comment. This was a great project to work on. Here’s a special thanks to Jon for being a great client. If you would like me to design a logo for you, please use my Logo Design Form for a free quote. Wow! you had some good ideas there. I like the final version but I think some of the sans serif ones earlier were really good. I lovelovelove the design with the two pebbles. Wish they’d have chosen that one, though I like the final choice, also. The one with pebbles is so fresh and different—not expected at all. What is the name of that font (in the pebbles version)? I must add that to my collection. Rob → Thanks. I thought the right logo was chosen in the end, and it works well on the site (not designed by me). Like yourself, I think some the the sans serif ones would have looked good, but I, and the client, loved the script font too.